JetBlue has witnessed impressive growth over its life. Despite this growth, the airline trades for roughly the same price today as it did 17 years ago. At today's prices, JetBlue is trading for only 5 to 6 times management's 2020 earnings guidance. Discounted earnings analysis, as well as looking at JetBlue’s cash flow statement, highlight just how cheap this stock is. What will it take to get investors to award JetBlue a fair multiple? No matter how you view it, JetBlue (JBLU) has been an impressive growth story over time. The company first went public in 2002 and has seen rapid growth since then. Capacity, measured in available seat miles (ASMs) has grown from 8.2 billion to 60 billion over that time. Revenue has grown from $1.7 billion to $7.7 billion over the same period. Meanwhile, operating cash flow has grown from $100 million to $1.2 billion, and book value per share has grown from zero to $15.30. In addition to all of these, JetBlue has maintained consistent profitability throughout its life. In recent years especially, JetBlue has been a remarkably profitable airline, with cumulative profits over the past five years of $3.1 billion. But one thing that has not grown along with the company is its stock price or the valuation it is being given by investors. JetBlue today trades at between 5 and 6 times the earnings per share guidance that was given by management earlier this year, and reiterated last week. It also sells for just over book value, which is a rough estimate for what you could liquidate the company for. Experienced investors know that when companies trade at or below book value the market is typically signaling that the company is either losing money, going to lose money, or has no reasonable growth prospects. The fact that JetBlue trades for such a low valuation might be a head scratcher to anyone who is new to investing. Long time market observers, however, are well aware of the valuations that are typically given to airline stocks. Single-digit P/Es are the norm, even after nearly a decade of strong fundamentals. So what will it take to get investors to give JetBlue a fair multiple? Flashback to 2002. JetBlue had only 8.2 billion available seat miles of capacity. That year, the company flew 5.7 million customers which generated $635 million of revenue. JetBlue was just getting started. Today, JetBlue has 60 billion available seat miles of capacity and flies 42.1 million passengers annually, generating $7.7 billion of revenue. JetBlue's daily flights, as well as the destinations served, have soared. JetBlue's fleet has expanded from 37 planes in 2002 to 253 today, and the cash has been pouring in. The charts below tell a tale of a growing corporation. The fascinating part is, if this company were a technology, a consumer staples, or an industrial company, this sort of rapid growth would be lauded. The fact that JetBlue is an airline, however, leads investors to value their growth, earnings, and cash flow significantly less than they otherwise might. It is also important to note that this growth has not come simply through issuing mountains of debt. In fact, JetBlue was a net re-payer of debt in almost every year from 2009 through 2017. 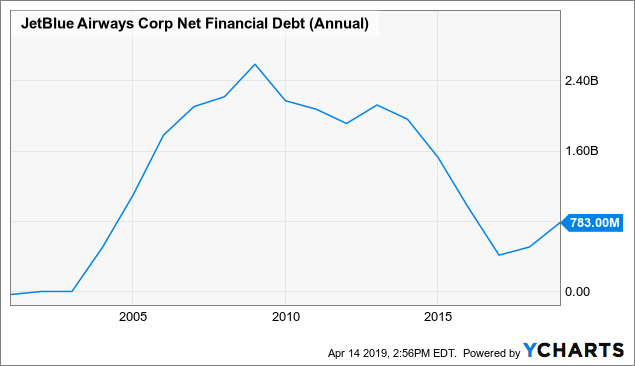 And don’t let the fact that JetBlue added debt in 2018 alarm you, the company was nearly net-debt free going into 2018 and they really don't need to reduce leverage any further at this point. In fact, I think it would be wise to use a little more leverage to buy in their shares right now considering their shares trade just above book value and only a few dollars higher than their 2002 IPO price. We know that JetBlue has been a phenomenal growth story over time, yet we also know that the market doesn’t appreciate that growth. So how do we value JetBlue? The fundamental way to value a company is through discounted earnings/cash flow analysis. This week, for the third time, JetBlue has reiterated their forecast for $2.50-$3.00 of per share earnings next year. The easy math tells us that if JetBlue hits anywhere in this range, their stock is trading for between 5 and 6 times forward earnings. Obviously that number is insanely low, but a lot of investors may still walk away because they see the entire airline sector trading at single-digit P/E ratios and they accept that as appropriate. This is where it helps to use the classic tool that has stood the test of time for valuing companies or streams of income, the discounting calculator. A discounting calculator, such as the one that can be found by clicking here, makes it easy to find the present value of a stream of future earnings. The reason you want to find the present value is because money earned years from now is not only less valuable because of the time we have to wait to earn it, but also because there is uncertainty that comes with predicting what something will actually earn five years into the future. Typically you would want to discount future earnings by the return you might expect to achieve elsewhere. I typically use 10% as a discount rate, which is about what I would expect to earn (including dividends) from the stock market in general. We already know that JetBlue is projecting earnings per share of $2.50-$3.00 next year, and we can look at a website like Zacks to find the up to date consensus of analyst's estimates. Analysts are currently projecting $1.90 this year and $2.27 next year, therefore we can immediately infer that the analysts that cover the airline industry don't have any confidence in JetBlue's forecast. I view that as an opportunity for an upside revision rather than a problem, after all, even if JetBlue doesn’t hit their own internal targets, they still could exceed what Wall Street analysts are telling their clients to expect. Analysts also expect 18% earnings growth for the next five years, a number which I also found on the Zacks website. There are two ways that we could think about this. We could begin our calculation with this year's earnings estimates of $1.90 and build in 18% growth for the next five years, or we could begin with the mid-point of JetBlue's own guidance for next year and reduce the growth rate. 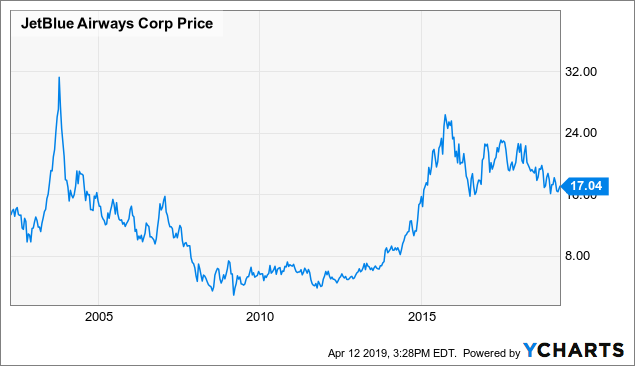 With $1.90 of base earnings and 18% growth for five years, leveling off to zero growth in perpetuity, discounted by 10%, JetBlue shares should be worth $38.77, or more than double what they are trading at today. Alternatively, if we begin with $2.75 of base earnings but only assume 7% growth for the following five years, we arrive at an intrinsic value of $36.77, which is also more than double what JetBlue shares are trading for today. I find it interesting that with either path, we arrive at a stock that is trading for less than half of its intrinsic value based on projected earnings and growth rates. If that alone isn't enough to catch your attention, remember that this assumes zero growth beyond the initial five years. As we all know, only a dying industry should actually have zero growth. 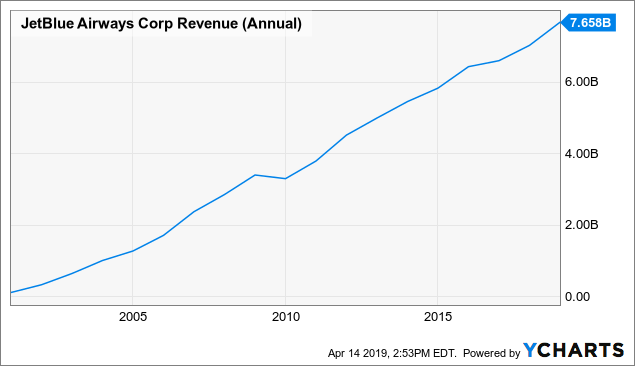 Between GDP growth, cost cutting, debt reduction, or simply through share repurchases, any company should be able to grow earnings per share by at least a few percentage points per year. Adding 3% as the terminal growth rate to either projection we arrive at an intrinsic value that is nearly triple what JetBlue shares are currently trading for. In a moment we will break down JetBlue’s cash flow statement to highlight just how cheap the company is, but before we go there, you’re probably already wondering how a stock could be trading at 1/3 of its intrinsic value right? The market must know something if it is this afraid of JetBlue. So what is the market afraid of? If you appreciate the value of using discounted earnings to calculate intrinsic value, then once you arrive at an estimate of value 200% higher than the current share price you naturally begin looking for reasons you are wrong. Maybe earnings won't grow to $2.50-$3.00 next year. Maybe they won't grow at all. Maybe we will have a recession. Maybe oil prices will soar to $100 per barrel and maybe JetBlue will begin losing money. Or maybe we simply can't value airline earnings like other companies because of the capital intensive nature of the business. Let's address each of these. Maybe earnings won't grow to $2.50-$3.00 next year. This is indeed possible. In fact, analysts are showing their skepticism by refusing to bring their own estimates up that high even as JetBlue itself has reiterated this target over and over. Earnings might not grow because we have a recession, which causes air travel to decline. Or earnings might not grow because oil prices soar and completely offset any revenue growth. It's also possible that oil prices soar and we have a recession (anything's possible right?). Ok, then what? Let’s say JetBlue doesn’t grow at all and earns $1.90 again in 2020 instead of the $2.50-$3.00 they project. At 8 times earnings, JetBlue would be trading roughly two dollars lower than it is today, a point at which it would also be trading below book value. Or maybe things get really ugly and JetBlue's earnings go down. The truth is, in most scenarios I can envision, investors are unlikely to punish JetBlue much more than a few dollars per share simply because it is already trading so close to book value. JetBlue doesn't really have any goodwill or intangible assets to write down and all of its earnings are retained (further building book value) so for the stock to trade below book value would really imply that the company was expected to begin hemorrhaging cash. I find that unlikely considering we have nearly twenty years of history of JetBlue running a profitable airline, including the years following the Sept. 11th attacks. So that leaves the possibility that airlines are simply going to be valued like this regardless, and it’s a waste of time to expect anything different. Maybe they will never get awarded a rich multiple because aircraft are so expensive and any growth consumes enormous amounts of cash, therefore none of the airlines are ever likely to distribute meaningful amounts of cash to shareholders. Sorry to have to say this but, isn't that exactly the situation with countless companies who have sky high valuations? How many years has Tesla (TSLA) been producing free cash flow? Zero. Shale oil drillers? None. Amazon (AMZN)? Very few. Wall Street doesn't seem to care that these other companies don't produce free cash flow as long as they are growing their revenue. Isn't growth all that matters to Wall Street? Obviously not if you are an airline, because the entire first section of this article highlighted just how much JetBlue has grown over the last two decades and it hasn’t helped shareholders one bit. Rather than bang my head against the wall trying to figure this out, my time would be better spent just buying JetBlue shares and using fundamentals, as opposed to price action, to determine whether or not I am right. Eventually, fundamentals always matter. JetBlue is one of the cheapest stocks I know of, and I don't plan on missing the upcoming price rise simply because I don't know when everyone else will begin to agree with me. I mentioned cash flow in the beginning, but I think this point is so valuable that it warrants further discussion. 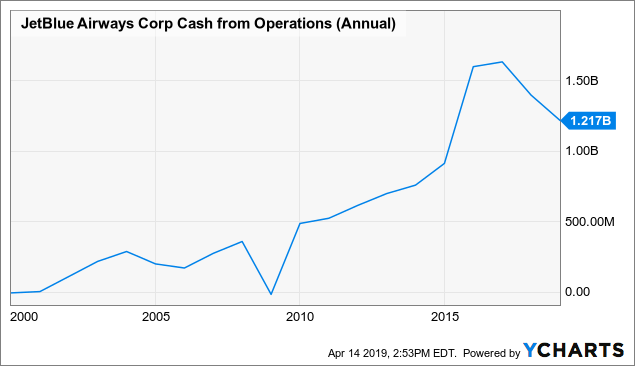 JetBlue's cash from operations over the last four years was well in excess of its current market cap. 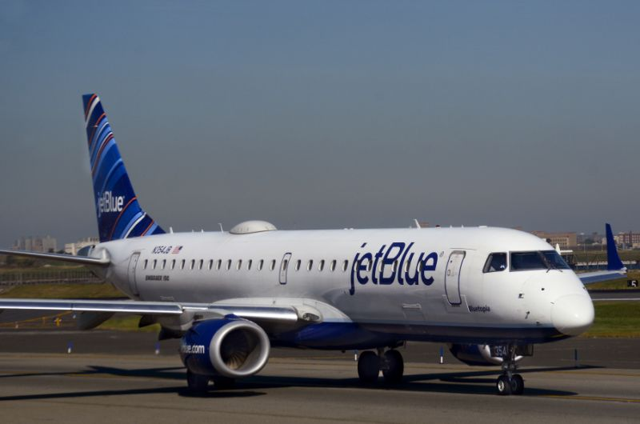 Now, critics might look at JetBlue and say that the company spends the overwhelming majority of the cash it produces buying new aircraft, therefore it should never be given a strong valuation the way that a capital light business such as Coca-Cola (KO) or Philip Morris (PM) would. I agree. But I'm not arguing that JetBlue should trade for 20 times earnings the way that these other companies do. After all, a company like Philip Morris can quite literally invest nothing into growth CapEx, yet still raise prices year after year and endlessly churn out higher profits. The problem that I have with this type of thinking (other than the fact that there really aren't that many Philip Morris like companies that exist) is the fact that a dollar is still a dollar no matter how it is earned. JetBlue happens to be in a capital intensive business, but that doesn't mean it has to endlessly pour in capital to stay in business. Rather, JetBlue is just a young company that has a lot of growth ahead of it, and therefore has been using their cash flow to fund their growth. Looking at JetBlue’s cash flow statement, if you separate CapEx into two categories, growth CapEx and maintenance CapEx, you can better see what I mean. JetBlue produced $1.2 billion of cash from operations in 2018. Then it spent $1.1 billion on CapEx, leading many to believe that JetBlue produces very little in the way of free cash flow. Technically this is true. But if JetBlue were to stop buying new planes, their free cash flow would skyrocket. Why? Simple. Their deprecation in 2018 was only $423 million. Depreciation is the accounting method used to devalue assets that are slowly wearing out and will eventually need to be replaced. JetBlue depreciates aircraft over an estimated useful life of 25 years, meaning every year, 1/25th of the value of existing aircraft is written off. If JetBlue were to stop growing, the only CapEx needs they would have would be to replace things as they actually wear out. For 2018, this would have been $423 million. Everything else would be free cash flow. This same thinking could apply to 2017 and 2016, a time in which JetBlue poured $1.5 billion into growth CapEx. Basically, if JetBlue weren't aggressively expanding, it would have had a free cash flow yield that fluctuated between 15%-25% over the last three years. I would never wish that JetBlue stop growing, but a private business owner could buy JetBlue at current prices, suspend growth, and pay themselves back in only a handful of years if they wanted to. That's how cheap JetBlue is. It's just too bad that JetBlue is an airline. So what will it take for investors to give JetBlue a fair multiple? This is a question that many airline investors have been asking themselves in recent years. Gone are the days when airlines were universally discarded as uninvestable. Warren Buffett’s entry into the sector with tens of billions of dollars was the canary in the coal mine that this is a different industry today, and year after year of profitability are proving him correct. I believe investors will have no choice but to come around eventually, as the airlines themselves are buying in enormous amounts of their shares, and if their stock prices don’t get bid up, they will likely end up buying all of their shares in the next decade. JetBlue specifically really only needs to do a few things to change investor sentiment. First, they really need to hit their 2020 earnings forecast of $2.50-$3.00 per share. Doing this would leave analysts scrambling to revise their 2021 forecasts higher, and that will inevitably lead to a higher share price. JetBlue also needs to succeed in their newly planned New York City to London and Boston to London routes, which were just announced this week. There is no doubt that the major airlines are not going to give JetBlue any market share without a fight, and JetBlue needs to intelligently enter this market, either by not being too aggressive (minimizing capital at risk), or by targeting an airport other than Heathrow airport, where the majors have a stranglehold on the market. JetBlue should also continue to intelligently allocate capital the way that it has done forever. By paying cash for most of its new aircraft instead of financing them, JetBlue has kept their balance sheet strong and interest expense minimal. Excess cash flow has also been wisely used in several accelerated share repurchase programs in recent years, and with the current share price so low, now would be a great time for several more. Finally, JetBlue needs to just keep doing what its been doing. Customers love them, and they have a long history of profitable operations. The market is funny, value stocks like JetBlue go in and out of favor over periods of years, not months. Sentiment changes slowly, but there is no doubt that value will matter one day. A stock with this much growth potential will not trade at 5 to 6 times earnings forever. Eventually something will give. And if JetBlue keeps up the rapid growth and intelligent capital allocation of its past, shareholders who buy at today’s prices will one day be delighted that the market valued JetBlue like an airline. Disclosure: I am/we are long JBLU. I wrote this article myself, and it expresses my own opinions. I am not receiving compensation for it (other than from Seeking Alpha). I have no business relationship with any company whose stock is mentioned in this article.